Comcast is collaborating with equipment manufacturers to bring the Xfinity Stream app to compatible Roku devices, Samsung Smart TVs and other Partner Devices. 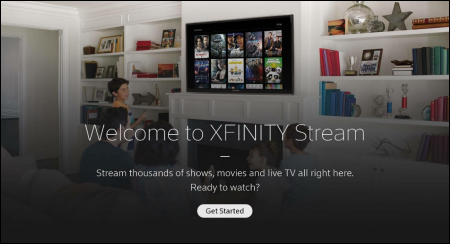 The Xfinity Stream app delivers live broadcast channels, linear cable channels, cloud recordings and video on demand, all without the need to rent an Xfinity TV Box from Comcast. The Xfinity Stream app is currently offered in a "beta" version that does not include the full set of features and functionality included in the Xfinity Stream app for mobile devices and web portal. Future releases of the app will include additional features and functionality, as well as improved stability and optimization. When using the "beta" app, you will not be charged an "additional outlet" service charge. Pricing may change in the future. 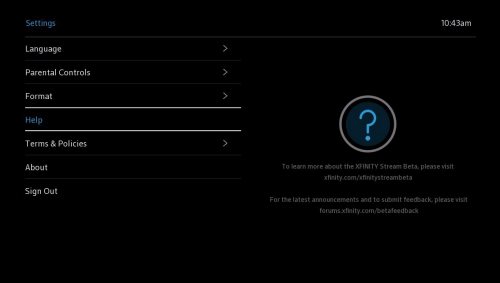 **NOTE**: The XFINITY TV Beta channel will only appear in the channel store for eligible devices. Launch the app and select Get Started to continue. The Activation Code screen will appear on the Roku device. 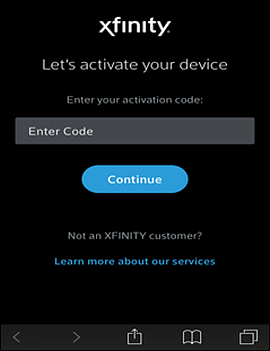 Go to www.xfinity.com/authorize from a mobile, tablet or desktop device web browser (not from the Roku) to continue the activation process. 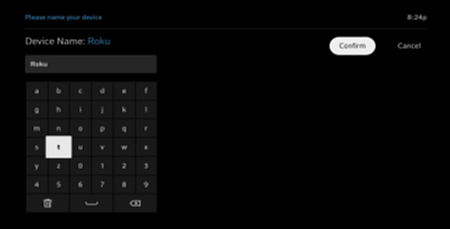 From the web browser (not the Roku device), enter the six-digit code provided. Still from the web browser, enter your Xfinity username and password, then select Sign In. The web browser will display a Success! 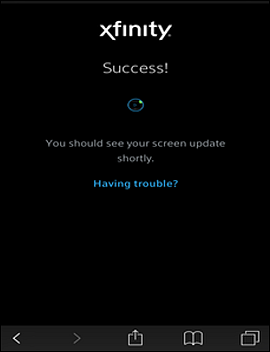 message, notifying you that your Roku device screen will update shortly. After a brief loading screen on your Roku device, you will be presented with terms of activation. Select Yes to accept the terms and continue. If you select No Thanks, you will be taken back to the first step of the activation process. Next, you will be asked to name your device. The home screen should then appear, and you are ready to begin using the app! Search for a movie, TV show or channel. Browse Live TV and On Demand programs by TV, Movies, Networks, Sports, Kids, News and Latino. Pressing the Instant Replay button on the Roku remote will skip back 15 seconds during video playback of Xfinity On Demand content. Pressing the Directional Pad Left and Directional Pad Right, respectively, will rewind and fast forward video during playback of Xfinity On Demand content (unless restricted). View TV Listings for all of your channels, watch live TV, set episode or series recordings, and view the programs in a certain category - Favorite Channels, Kids, Sports or Movies - that are on now or coming up soon. 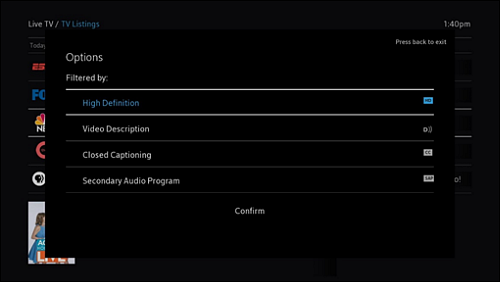 You can also filter live TV by High Definition, Video Description, Closed Captioning and Secondary Audio Program. Access Playback Controls to control accessibility settings, including Video Description, Secondary Audio Program and Closed Captioning. 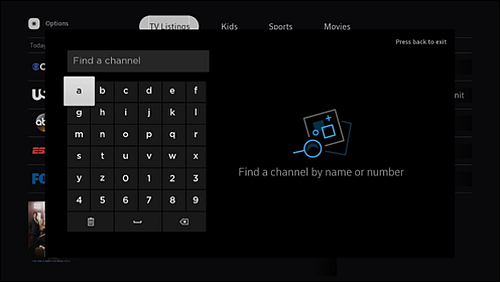 Select Options (top left) within Live TV to Find a Channel, access Filter Preferences and Search. 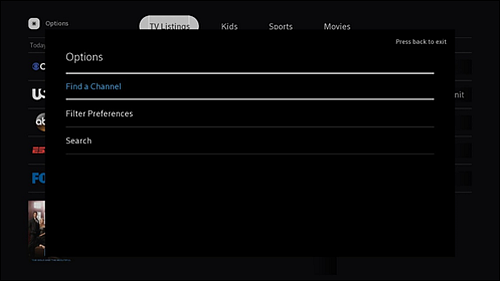 Selecting Search will take you to the main Search page, to search for a movie, TV show or channel. Find a Channel: Find a channel by name or number. Filter Preferences: Filter live TV by: High Definition, Video Description, Closed Captioning, and Secondary Audio Program. **Note**: To access Playback Controls, you will need to press the down arrow on the Roku remote while watching live TV. This will present you with a caption icon. 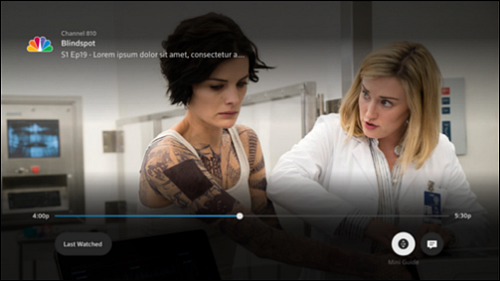 Use the Roku remote left and right arrows to highlight either Video Description, Secondary Audio Program or Closed Captioning. You can then select OK to turn the option on or off. From any live channel, you can access the Mini Menu by selecting Mini Menu on the media player or pressing right on your Roku remote. 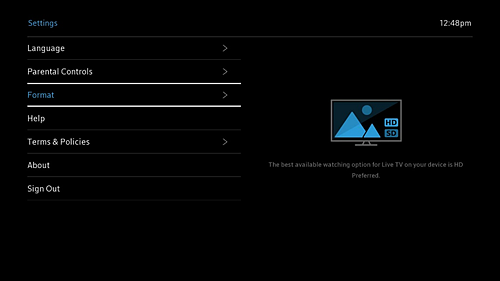 Use the Mini Menu to discover and quickly change to other live channels. View the For You screen, Recordings, Scheduled Recordings, Favorites or Purchases (when applicable). Pressing the Instant Replay button on the Roku remote will skip back 15 seconds during video playback of DVR content. Pressing the Directional Pad Left and Directional Pad Right, respectively, will rewind and fast forward during video playback of DVR content. 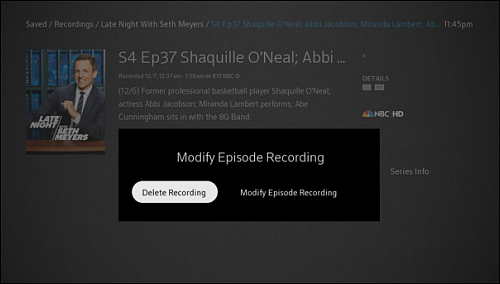 You can delete recordings by highlighting the TV episode, selecting Modify Movie Recording, followed by Delete Recording. **Note**: You cannot delete recordings in bulk (for example, an entire series) on your Roku device. 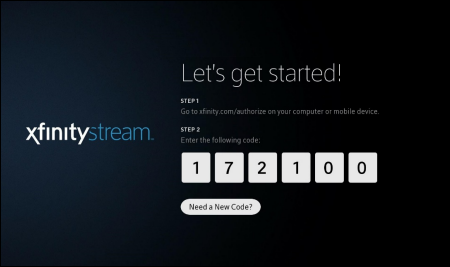 However, this can be done directly on your TV Box or by using the Xfinity Stream app. You may also recover recordings that were deleted in the past 24 hours by navigating to through the following menus - Saved > Recordings > Deleted Recordings - and selecting Undelete. 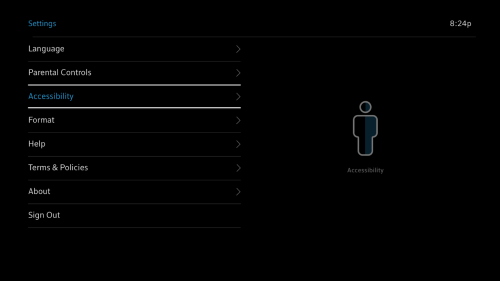 Access app settings such as Language, Parental Controls, Accessibility, Format and Helpoptions. 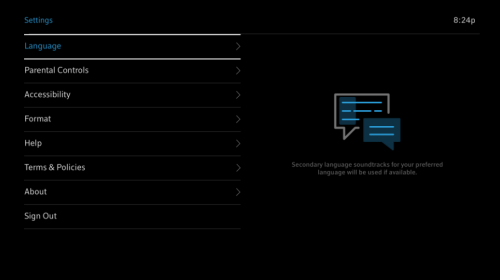 Language settings allow you to set the default language for Secondary Language soundtracks (SAP option in Playback Controls when available). 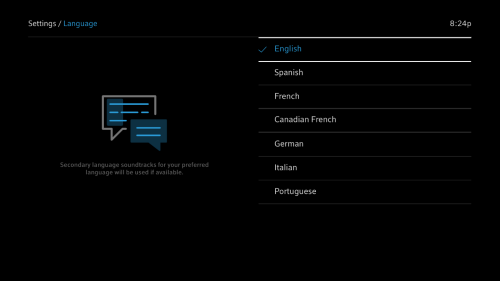 Language settings do not change the language for menus or TV listings. 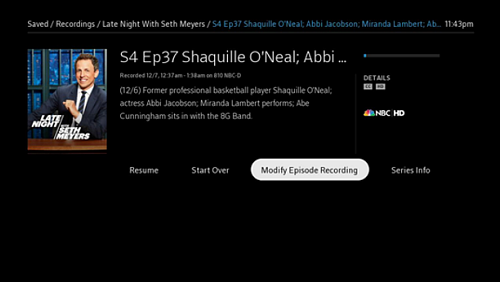 SAP may experience intermittent availability in the Xfinity TV Beta app. Parental Controls are device-specific. Even if you previously set Parental Controls for another device, you have to set them again for the Roku device, as Parental Controls default to the Offmode. In order to modify Movie Ratings or TV Ratings settings, Parental Controls must be set to On. Locking a rating will automatically lock all higher ratings. For example, locking the R rating will automatically lock the Adult and NC-17 rating. 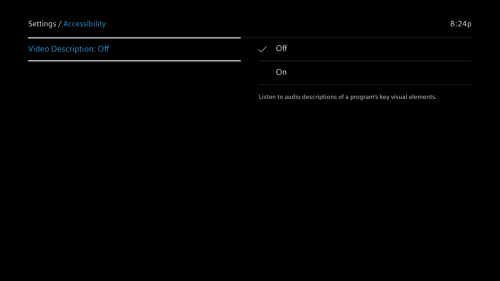 You can also turn Video Description, which allows you to listen to an audio description of a program's key visual elements, On or Off in the Accessibility menu. A Format option located in the Settings menu allows you to automatically tune to the High Definition (HD) version of a live TV channel if you select the Standard Definition (SD) version. 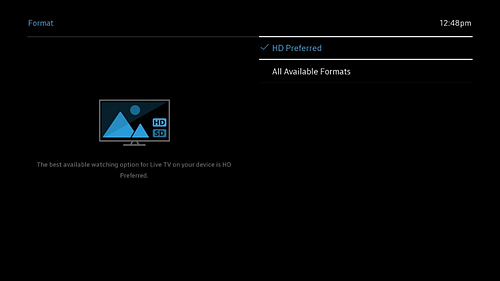 The HD Preferred option is selected by default. 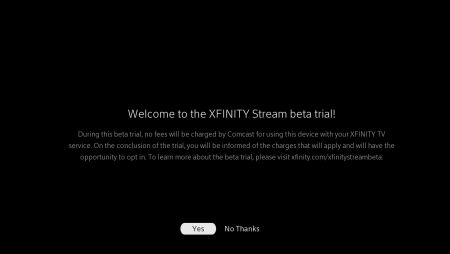 A Help option is located in the Settings menu that will direct you to xfinity.com/xfinitystreambeta for more information. 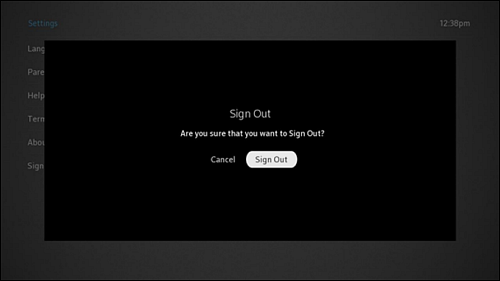 The option to Sign Out of the app on your Roku device is also available in the Settings menu. 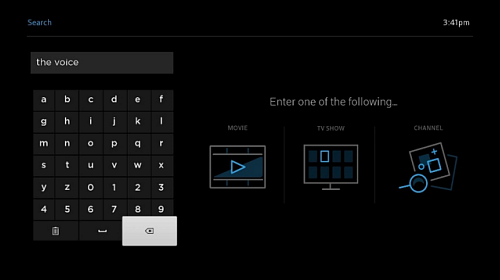 You can sign out by tapping the OK button your Roku remote. You will then be returned to the Getting Started screen. 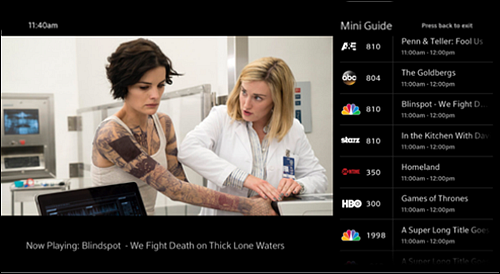 What programming and features will be available with the XFINITY TV partner app? Am I eligible to use the Xfinity Stream app on Xfinity TV Partner Devices? Customers must subscribe to Xfinity TV and Xfinity Internet. All Internet speed tiers are eligible. Customers must use a Wireless Gateway rented from Xfinity or bring a retail modem that is certified to work on the Comcast network. Please visit mydeviceinfo.xfinity.com for more information on compatible equipment. Does the Xfinity Stream app for Partner Devices have the same features as Xfinity X1? Does the Xfinity Stream app work on all streaming devices? No. Currently only certain devices have the Xfinity Stream app. We anticipate adding more equipment manufacturers and devices during 2018. For eligible device models, see the activation information for Roku devices and Samsung devices. Why are some models not supported? Not all device models meet the minimum hardware requirements for the Xfinity Stream app. We are working hard with equipment manufacturers to bring the Xfinity Stream app to additional devices and models. I am having trouble downloading and/or installing the Xfinity Stream app on my supported Partner Device. What should I do? Please verify that you have a supported device model. Please check the firmware version of your Partner device to ensure you are using the minimum required version. To update to the latest firmware on Roku, navigate to Settings > System > System Update from the home screen, and press OK to check for updates. To update the latest firmware on Samsung Smart TVs, press the Menu button on your remote control. 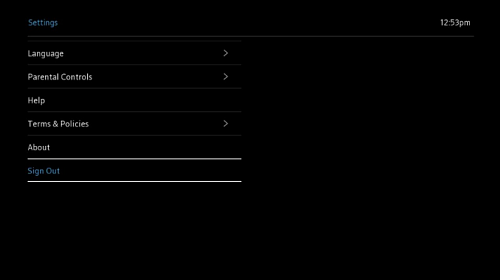 Use the down arrow to select the Support tab, select Software Update then select Online. As long as your Samsung device is connected to the Internet, it will connect to the Samsung servers to look for an update. If there is an update available, it will begin installing automatically. Verify that your Partner Device is connected to your Xfinity Internet service. Due to the design of the Partner Device, it cannot operate the Xfinity Stream app unless it is connected to Xfinity Internet. Do I need to rent an Xfinity TV Box for the Xfinity Stream app to work on my Partner Device? No. If you are a new customer, you can simply opt to use your Partner Device without renting an Xfinity TV Box from Comcast. For more information on the difference in features and any credits and fees associated with using a Partner Device instead of renting a TV Box from Comcast, please refer to the Credits and Fees section below. Do I need to rent an Xfinity DVR-capable TV Box to get DVR service on my Partner Device? No. If you use a Partner Device, you can subscribe to the Xfinity DVR service without renting a DVR-capable TV Box from Comcast. You can access and manage your recordings from the Xfinity Stream app on Partner Devices. If you are a current Xfinity TV customer with DVR and you rent an Xfinity TV Box or use a Partner Device to access the Xfinity Stream app, you can set and delete your DVR recordings directly on your Xfinity TV Box and/or your Partner Device. At this time, remote recording control is not available. I already subscribe to Xfinity TV. If I return my Xfinity DVR-capable TV Box, will I still have access to the recordings that were stored on that box using the Xfinity Stream app? 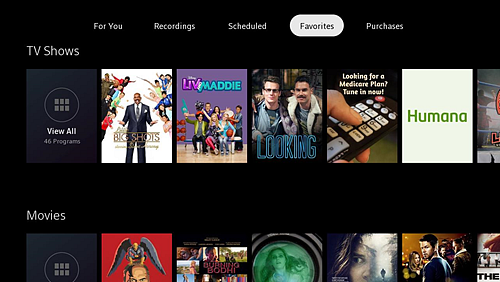 If you are an X1 DVR customer, you will be able to retain some of the recordings from your Xfinity DVR TV Box in the cloud and access them through the Xfinity Stream app. Legacy (non-X1) DVR customers will lose the recordings stored on legacy TV Boxes. 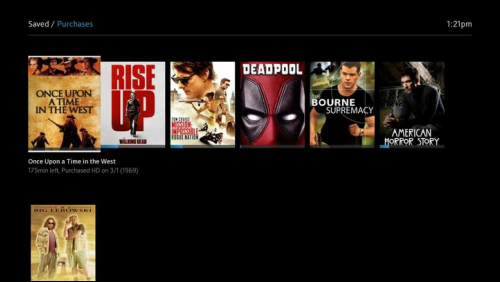 Can I view all my previously purchased movies and TV shows using the Xfinity Stream app on Partner Devices? What if I returned all my Xfinity TV Boxes? Yes, you can continue to view all of your previous content purchases through the Xfinity Stream app and Xfinity Stream portal. This remains true even if you return your Xfinity TV Box. If I am a new customer, how do I order Xfinity TV service without renting a TV Box from Comcast? You can order Xfinity TV online at xfinity.com or call 1-800-xfinity to order Xfinity TV without a TV Box. I just ordered Xfinity Internet and Xfinity TV without renting an Xfinity TV Box from Comcast. Will the technician who installs my Internet also set up my Partner device? No. Partner devices, like all other customer-owned and managed devices, are installed and activated by the customer. Comcast technicians will not install supported Partner Devices. For more information about setting up the Xfinity Stream app on your supported Partner Device, please consult the setup guide or support web page for your Partner Device. I just ordered Xfinity TV service; can I use the Xfinity Stream app on Partner Devices prior to my professional installation? No, you will not be able to access the Xfinity Stream app on Partner Devices until your Xfinity Internet is activated. Why is Xfinity Internet required to use the Xfinity Stream app on a Partner Device? Partner Devices need an Internet connection to run their operating system. Since they lack the capability to connect to two different networks at the same time, they must connect to a single device that can deliver access to both our managed cable network and the Internet simultaneously. Currently, the only way to access both at the same time is through the modem or gateway used with your Xfinity Internet service. My cable TV service is provided through the Xfinity On Campus program. Can I use the Xfinity Stream app on Partner Devices? 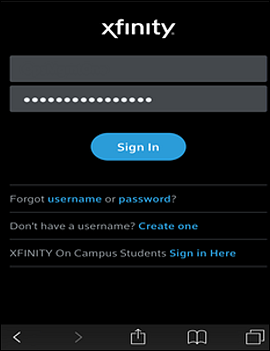 Yes, Xfinity On Campus customers can use the Xfinity Stream app on Partner Devices while the supported Partner Device is connected to your campus Wi-Fi network. Note: Xfinity on Campus service is currently only available on Roku devices. Samsung Smart TVs will be supported in a future release. I'd like to use the Xfinity Stream app, but I don't own a Partner Device. Can I purchase a device from Comcast? No; however, you can purchase these devices at many retail and online stores. Can I take my Partner Device to my friend's house, hotel or vacation home and access the Xfinity Stream app? No. The Xfinity Stream app will only work if the device is connected to your Xfinity Internet in-home network through Ethernet or Wi-Fi. 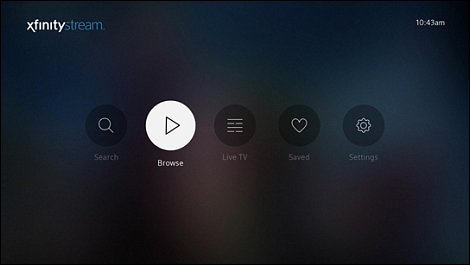 If you would like to access your favorite content when you are not connected to your Xfinity in-home network, you can use the Xfinity Stream portal on your web browser or the Xfinity Stream app on your smartphone, tablet, or computer to watch your recordings and available content over the Internet. Does the Xfinity Stream app on Partner Devices offer parental controls? 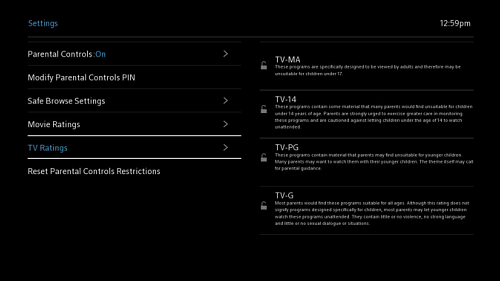 Yes, parental controls can be customized within the Xfinity Stream app settings. Please note, if you use the Xfinity Stream app on multiple devices you will need to set the parental controls separately in the Xfinity Stream app for each device. 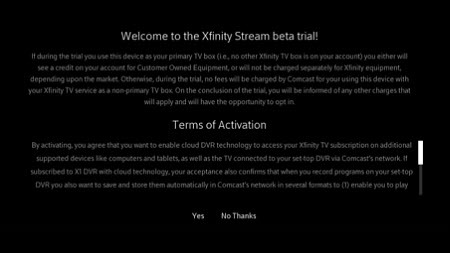 For parental control instructions on the Xfinity Stream app for Partner Devices, see setting Parental Controls with the stream app. How many Partner Devices can I use? Xfinity TV customers can stream to up to five devices simultaneously, with a total of 45 devices registered on the account. The limit of five simultaneously streaming devices includes Partner Devices, mobile devices (iPad, tablets, phones), and computers. Xfinity Instant TV customers can stream to up to two devices simultaneously. Does placement of the device impact my streaming experience? Yes, the Wi-Fi signal strength at the device can impact streaming. Therefore, the Roku device should be placed where your in-home Wi-Fi signal is strong. Is there an additional charge for using a Partner Device? There is no additional charge for using the Xfinity Stream app on Partner Devices. All other fees associated with your service will still apply, except during the beta trial, we are waiving the "additional outlet" service charge if you use the Stream app on a Partner Device. Pricing may change in the future. If the cost of renting the first Xfinity TV Box is included in my package price, do I get a credit if I do not rent an Xfinity TV Box and use a Partner Device instead? If your package price includes the cost of the first rented Xfinity TV Box, you will receive a credit for use of a Partner Device on your primary outlet (assuming you have no rented Xfinity TV Boxes). If you are an existing customer who has an Xfinity TV Box, you must return your equipment to Comcast to receive this credit. If your equipment rental is charged separately in your Xfinity TV package, you will not be charged for use of the Xfinity Stream app on a Partner Device on your primary outlet. Does streaming using the Xfinity Stream app on a Partner Device count against my Internet data usage? No. The goal of using the app on your Partner Device is to give you more options outside of our rented TV Boxes to access your full TV service within your home. The service delivered through the Xfinity Stream app is not an Internet service, so our data usage plans don't apply. However, video services that are delivered over the Internet, like TV Everywhere content accessed via the Xfinity Stream app and portal or content from NBC.com or the NBC and NBC Sports apps, are treated exactly the same way as any other Internet-delivered services like Netflix, Hulu, or Amazon, and are subject to any data usage plans that might apply. For an optimum streaming experience on a Roku device or TV, keep within range of the wireless router. Avoid placing on top of other devices, and keep clear of obstructions. Do not place in an enclosed area or direct sunlight. To receive a stronger wireless signal, try moving or rotating into different positions. Even a few inches can help. If you are experiencing any issues with the App or have any questions, please don’t hesitate to let us know on this thread. When will a Xfinity TV app be available on ROKU?? I installed the Watch Foodnetwork app and the Watch HGTV app on my IPad and was able to activate since Xfinity/Comcast was a listed provider-----however on my Roku when I installed the Watch Foodnetwork Channel and the Watch HGTV Channel I couldn't activate because Xfinity/Comcast is not a listed provider----WHY NOT? great question and would love to see an answer on this. I want answers to this too!? Why oh why? No HGTV or Food Channel...come on Comcast, we pay lots for your service! 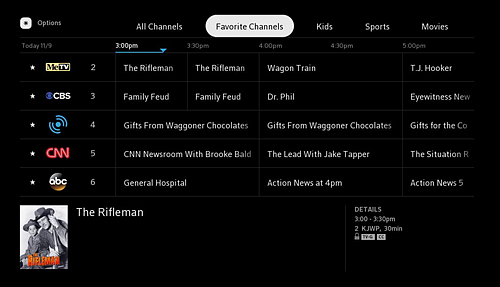 Time Warner has their own app on Roku, which allows you to view any of their channels via Roku. I haven't seen it, but I have heard that Cox has the same thing. Why doesn't Xfinity have this? We have a home in the Atlanta area where we have Xfinity X1. We want to watch local Atlanta shows and regional sports on a TV at our home in Texas where we have Time Warner without having to run it through a tablet or smartphone. We can do it with a Slingbox, but it would be much simpler if Xfinity had a Roku app like the other major cable providers. It is very disappointing to see that there are no plans for an Xfinity app for Roku, especially given that the other major cable TV providers (Time Warner, Cox) have apps for Roku (and especially given how much we pay for Xfinity X1). We have Xfinity X1 at our home in the Atlanta area and Time Warner at our home in Texas. We want to be able to watch local Atlanta shows and regional sports on a TV at our home in Texas without tying up a computer or tablet. We can do this with a Slingbox, but it would be much simpler to do it via a Roku app. I suggest filing a Better Business Bureau complaint, in order to get Comcast's attention. Whether Comcast believes it or not having access to those apps allows them to increase their customer base because I consider their prices more resonable than their competitors. I think we should bring this to their attention. I am filing one today because I love watching Food Network, I want access to all of the content, especially if I pay for a subscription to their channel. Will my ROKU pick up Xfinity to GO? This would be great to allow TV watching without running new cables and adding another box. Perhaps since soon we might have regulations stopping comcast from charging so much for Box's this will be allowed. This is just one more reason that Comcast is the most hated company in the US. I'm trying to get MTV on my Roku and they aren't listed as a provider. That's the name of the game right there. Comcast doesn't WANT us to be able to get rid of a box we have to pay monthly rates for. The only thing that will stop this is not legislation or the Government. It never does because it's too easy for Comcast to pay off the politicians. No, the only thing that will stop this is COMPETITION. This is why I'm seriously going to look at Google Fiber (I live in Nashville). I've been a Comcast customer for 15 years. Comcast.....give me some reasons to continue. Give us a Roku TV streaming App for in home network use. Even if there is not an Xfinity Roku app, we should be able activate the channels we like to watch on Roku in bedroom without setting up a laptop. Xfinity appears to be the only major providers which is not activation codes. I am in the process of migrating from Direct TV to Xfinity and this was a big surprise, I have a 30 day guarantee and holding off canceling Direc TV for another week to fully understand this and my other surprises. There is a list of well over 100 tv service providers that work with Roku listed at the Roku site. Comcast/Xfinity is the only major tv service provider who refuses to work with Roku or any other companies that provide a similar service such as Amazon TV. This action fits in with Comcast's notorious poor customer service. We have paid for these channels with Comcast yet they will not let use Roku to view these channels. We need to complain to the FCC and BBB possibly politicians, but most of the politicians are already in the pockets of companies like Comcast. In Europe, the lines, infrastructure for internet and tv service is owned by the government and companies like Comcast have to compete to provide tv services. The result is about half the cost of what we pay and the customers receive much better service. More competition works. This is very disappointing considering when we had xfinity installed we were told that the signal into our apartment was too weak to have another box installed and apparently fixing the signal strength wasn't on the techs agenda. So we have Roku in the bedroom since xfinity wouldn't install in the bedroom and we watch 75% of our tv in bed... perhaps it is time for us to cut the cord on our tv service. Hi IChaudhry -- Apologies for the tech. I reviewed your account and the health check on it showed great signal strength. It is common for apartments to have restrictions on wiring new outlets in their units. Is that what you were trying to have to done or were you asking for the tech to just run cable to a box? Aren't there new FCC regs out there that make this app a necessity? I thought the day of the extra digital converter set-top boxes was over and we would be able to view our subscribed TV through any streaming device. This better include ROKU. Of course Comcast will be fighting this tooth and nail when ALL their customers want this to happen. Maybe be nice to us and we'll be happier customers. Just sayin' maybe it is time to listen to what your customers want instead of nickel and diming us to death with forced equipment and over charges (not to mention fees that pretty much don't need to be taken from us). So Comcast isn't interested in giving CUSTOMERS what they request, they are only interested in doing what they are FORCED to do by the FCC? What a crock of bull! The minute my contract is up, Comcast is going to be relegated to the proverbial gutter. Comcast today announced a partnership with Roku Inc. that will continue to expand the range of retail devices Comcast’s customers can use to access their Xfinity TV service. Later this year, Xfinity TV customers will be able to enjoy their cable subscription in the home via the new Xfinity TV Partner app designed specifically for Roku® TV™s and Roku streaming players. "Roku is one of the largest providers of streaming TV devices and an innovative pioneer in the space, and we are thrilled to provide Xfinity TV customers with access to their subscription across Roku devices," said Mark Hess, Senior Vice President, Office of the Chief Technology Officer, Business and Industry Affairs, Comcast Cable. "We want to give our customers the ability to watch what they want, when and where they want, and we will continue to explore new partnerships to bring Xfinity TV content and user experience to even more retail devices." Featuring Xfinity’s Emmy Award-winning guide, the Xfinity TV Partner app for Roku devices will provide customers with access to their live and on demand programming, including local broadcast, cable and premium networks, Public, Educational and Governmental (PEG) channels, as well as their cloud DVR recordings. "Roku customers enjoy the ability to access their pay TV subscription using their Roku player or Roku TV without the need to lease a set-top box. These types of channels are very popular on Roku and offer a lot of convenience to our customers," said Steve Shannon, GM of Content at Roku. "Comcast is one of the most popular pay TV operators in the U.S. and since many Roku customers are also Xfinity subscribers we believe the new Xfinity channel will be very popular when it launches this fall." In addition to the new Xfinity TV Partner app for Roku, Comcast recently launched its broader Xfinity TV Partner Program which enables Xfinity TV customers to receive their Xfinity TV cable service on connected TVs and other IP-enabled third-party devices. Partners who are interested in including the new Xfinity TV Partner app on their devices should visithttps://developer.xfinity.com/cableapp or contact Comcast directly via email at partner@comcast.com. I literally just got off the phone with your customer service rep who said there is NO REASON that I shouldn't be able to get the Xfinity app to come up on Roku. But it doesn't and from reading the forums it sounds like it's not available. So someone is incorrect...please advise! It's coming out in the fall for Roku. Keep monitoring the Roku blog for updates. I would believe more of what you read in the forum than what a phone rep would tell you. Their track record for telling the truth is sub par at best. As stated, the Xfinity TV (partner) App (Channel) is not yet available on Roku... but soon. However, the FoxNow, HBOGo, NBC, and ABC Channels are available on Roku. Moreover if you're a customer of Xfinity, or Xfinity Stream TV (even the 1 month free version), you can access those channels via Roku with your Xfinity sign-on credentials. That's somewhat of a limited selection, but it's a step in the right direction. I just heard the ROKU CEO on CNBC talking and he said they are going to launch an Xfinity app after they came to an agreement with Comcast. Do you know when this is going to happen? I came across the same problem and everything kept directing me to sign up for slingtv which includes all the channels not listed on those sites. For an extra 20 a month. Laughing because that is ridiculous after already paying a cable/internet company so much. Use the roku that has the TV without the router. All you have to do is sign in to your provider, pick your channel in the list and put in the code that roku gives you. Worked like a charm once I opened up the activation window. I now have the channels my providers provides on my roku. Will this Roku app eliminate the need for HD cable boxes? I'd save $20 a month right there. that link isn't working for me...any tips? If you have a subscription for HBO or Showtime, you can access HBO Go and Showtime Anytime on the roku device. 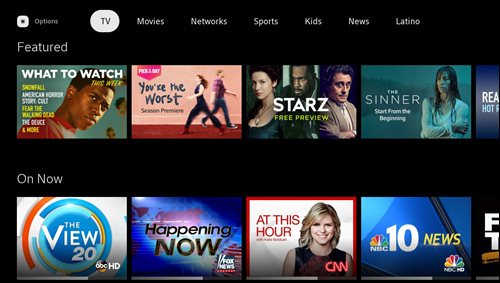 Comcast will be launching a XFINITY TV partner app on Roku devices later on in the year. Below are some of the programming and features that will be available with the XFINITY TV partner app. Why wait! If you have an android phone or pad running 4.4 or later version, get yourself a google cromecast unit for $35. Download the chromecast app. to the phone or pad In the app, open the settings. It allows you to cast the screen and audio to the cromecast unit. Then start up xfinity tv go app. You are connected! I use this on the road, just take the cromecast with you (fits in your pocket). The only stations that you cannot get live are NBC, ABC, and CBS. You get all the movies and tv you will ever need. Will the new Xfinity App for Roku play 4K content? Is there a release date set for the Roku app? or do you know when it will be availabe on Roku? I've been looking but I haven't seen it. Already subscribed to streamTV and it's great on laptop, however it is kind of useless on the Roku since you have to go to each individual channel's app and even then it's still limited because some of the apps don't have a live TV service yet. I had the same question! the stream service is pretty useless on a roku without the app! Is there a release date for the app on Roku? Is it a for sure thing that will be released? No. After their failed timeline the Xi4 box then the Xi5 box then for the Olympics in 4k, I'd be surprised if it even comes out this year. Is there a release date set for the Roku app? or do you know when it will be availabe on Roku? Exactly why I just canceled all TV except for one and got a discount on that. The Internet is all I really need. Vote with your wallet folks. How can you stream on a Roku? 1. X1 cable TV service has nothing to do with Roku. At least not yet. 2. If you are interested in Roku, you will need to buy a device that provides Roku. 3. If you have an internet connection, you can stream on a Roku device. If you have a Roku device. 3. I have Comcast internet service and I also have three Roku boxes. They work just fine. Is there a release date, now that it's a little later in the year? I'm looking forward to using our Rokus to view Comcast as if it were on a set-top box. Are you kidding me. Just bought a Roku device for tv in garage to find out I can't stream many channels that I pay for on xfinity 1 platform. So once my contract is up I'm done with Comcast. Antenna and sling tv here I come. Come on Comcast get with the program! So frustrating! Isn't there a xfinity app coming out for the roku? Yes there was an extremely vague announcement about some afilliation between Comcast and Roku. The announcement created more questions than it answered.